A natural stream channel remains stable over a wide range of flows, typically accumulating sediment during low flow periods and carrying sediment downstream during high flow periods. Changes to the channel, vegetation, floodplain, flow or sediment supply may affect the equilibrium and cause the stream channel to become unstable. This course covers procedures for evaluating the stability of a stream channel reach and planning and design for restoration of an unstable stream channel reach to bring it back into a stable condition. This course is intended primarily for civil engineers, hydraulic engineers, hydrologists, and geologists. 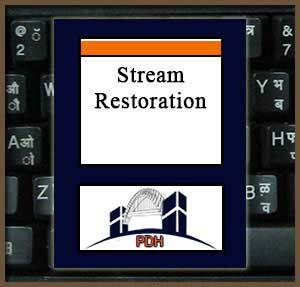 Someone completing this course will gain knowledge about stream channel evaluation and stream channel restoration procedures. In this course, you need to review the material in the course content file, consisting of the document, "Stream Restoration - A Natural Channel Design Handbook," prepared by the North Carolina Stream Restoration Institute and North Carolina Sea Grant. Once you complete your course review, you need to take a multiple-choice quiz consisting of forty (40) questions to earn 7 PDH credits. The quiz will be based on the entire document.